For more than twenty-five years, Borealis Breads has been a vibrant and lasting part of Maine’s dynamic food scene. Relying on locally sourced ingredients and grains grown and processed right here in Maine, Borealis owner Jim Amaral was a pioneer in the local food movement and helped lead the way in Maine's wheat and grain renaissance. As much a celebration of the art and science of sourdough as it is the success of an iconic bakery, this book presents favorite recipes from the bakery, plus delicious options for pairing with such delicious breads as Rosemary Hazelnut , Lemon Sage Flatbread, Portuguese Corn Bread , Maine Coast Focaccia, and many more. Cynthia Finnemore Simonds is the author of five cookbooks: Fresh Maine Salads, Superb Maine Soups, Delicious Maine Desserts, Gelato Fiasco, and Borealis Breads. She has advocated for local food sources and scratch cooking all her life. She loves improvising in the kitchen and on the dance floor, where she does Lindy Hop vernacular jazz swing dance. She lives in Newcastle, Maine. Find her online @Mindful Mouthful. 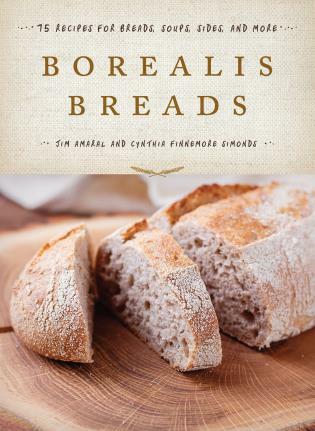 Jim Amaral, owner of Borealis Breads has been exploring the art of sourdough baking for more than two decades, pioneering the use of locally grown grains and Maine milled flours. One of the founding artisan bakers in Maine, his company enjoys enormous popularity and recognition in the region. Jim Amaral, founder and owner of Borealis Breads has worked with area farmers to grow custom grains and become a vibrant part of Maine’s foodscape. This collaboration is a book about the renaissance of Maine grains, recipes from the bakery’s twenty-five years, how Maine made it to this point in its agricultural life, and where the farmers, millers, and bakers will take us in the future.